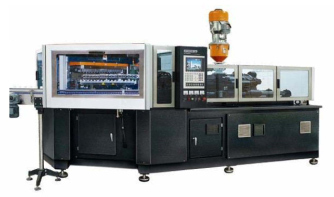 Injection Blow Molding Equipment | Pet All Manufacturing Inc.
Machinery is designed and built under the “CAN MOLD” Brand and the “NEXION” Brand. The NEXION series is the more traditional type of machine with the hydraulics above the head. These machines are tough, reliable work horses with a lower price than the "Inverted Head" series above. Sizes available are from 38 Ton to 75 Ton: larger sizes are preferable in the Inverted Head style for reasons explained above. Full IBM Plant (Tools, Leak Tester, Vision Control, Metal Detect, Pack Out) We offer a turnkey solution to all projects; a complete cell will include a full range of IBM Tools made to world class standards (fully engineered and drawn up in USA), Leak Testers built at our factory in Canada, Vision Systems built in USA and engineered into our lines in Canada, Metal Detectors and Box Pack Out at the end of the line. The IBM Sector is our main focus and Pet All installs machines and tools in quantities in markets such as USA, Canada, Mexico, UK, Germany, Brazil, India, Russia and Spain. 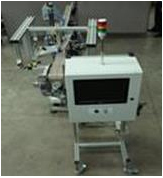 Sold under our CAN MOLD Label, these machines are available in three basic types. There are Linear Carriage, bobbling head style machines. We specialize in large, heavy duty machines up to 30 L capacity. A typical line would be an 8 cavity gallon (2 x 4 cavity) machine ideal for high production of F style gallons with handles. A Small Bottle Series (SBL) is available in high cavitation (up to 20 cavity) in both Hydraulic and All Electric Versions typically up to 1.5 litre. 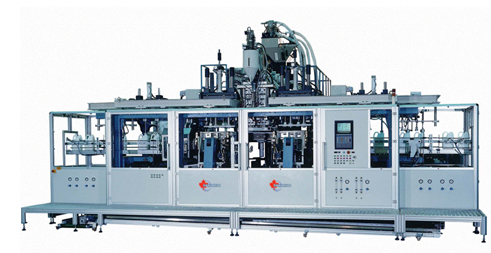 These are angled carriage extrusion blow machines (Work Horse Series) in container sizes up to 7.5 L. Highly reliable, low cost, these machines are very popular with smaller blow molders. These machines are made for very large containers or parts. We can produce machines for containers up to 3000 Litres. Our leak testers can check small bottles in one head at up to 9000 parts / Hour. Most leak testers are supplied in line with our CAN MOLD IBM machines. Several hundred leak detectors have been sold worldwide, and they are the gold standard for the IBM industry. The complete line is manufactured in our Canada / USA facilities. Pet All Mfg. Inc. supplies in North America only the Chum Power line of RHSB PET machinery. An outstanding range of all electric, continuous motion, high speed linear machinery in up to 12 Cavities is available. Sizes up to 5 gallon are available in fully automatic systems. 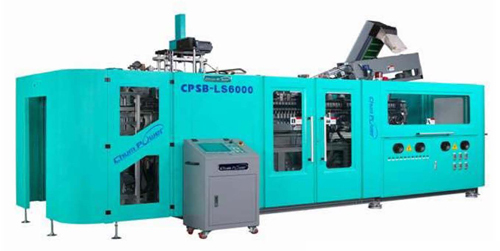 Injection molding machines for preform (turnkey) with molds are also standard. Pet All also supplies our own compressors for Pet Lines. 10 different semi-automatic Pet RHSB machines are available in up to 5 gallons. These are compact, reliable, 2 part systems with separate heater and blow machines. The above 4 categories are supported by a team of engineering and support staff in Canada, NJ, SC, AZ, MI, UK, Brazil, Mexico and China.